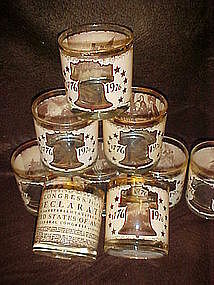 Here we have some glasses that were put out for our US Bicentennial. Through the liberty bell on the front you can see a scene of our historical importance printed on the inside of the glass. Some have Washinton crossing the Delaware, Betsy Ross sewing the flag, Signing of the Declaration of Independance,and the alliance with the Native American Indians. There are no chips or cracks but on most of them the gold is worn from the rim. Each measures 3 3/8" tall. Price is for each. Please specify inside scene desired. Price is for each glass. Declaration signed july 4 1776 on the back of each glass.